Plan your semesters better! 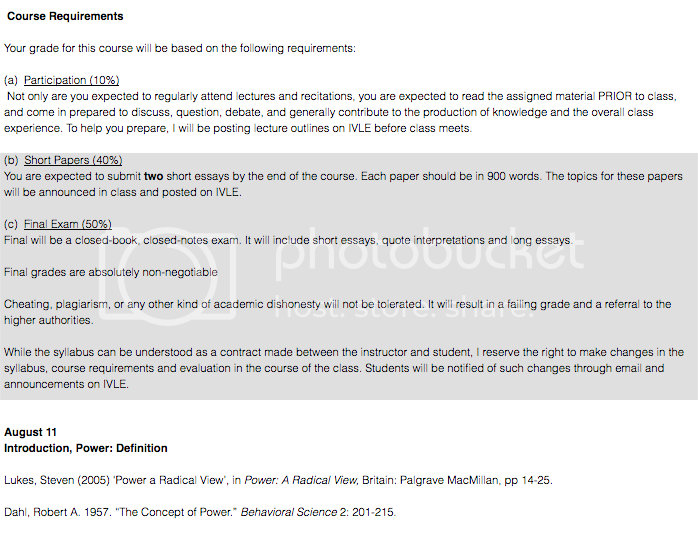 IVLE SEARCH for Module Descriptions, Reading Lists, and Assessment Methods! IVLE is where you access the files for the modules that you are enrolled in; it is where you download your lecture notes, readings, and submit your assignments. If you’re enrolled in a module, the list of modules will show up on your homepage (after the log-in landing page); if you’re still in the bidding period, and would like to see more comprehensive module descriptions beyond what is available on CORS, you can search for the module on IVLE as well. The course descriptions on CORS are typically outdated, and even if it is updated, a paragraph is often insufficient to account for what the module is about. This is when you use search. Go to IVLE, and click on search on the upper-right-hand corner, or simply click on the link below. There are five fields that you can fill out, but you don’t have to fill in all of them. Entering the Module Code will usually do; and if you’re not looking for a specific module, entering just part of the module code (e.g. SC3) will work as well – it’ll be taken as a wildcard, whereby all the level 3000 Sociology modules will turn up because they contain “SC3”. I think this is very useful for when you’re deciding which modules to take to fulfil your graduation requirements – it essentially returns a listing of the available modules that semester, much like CORS does. To prevent modules from other faculties from showing up, e.g. 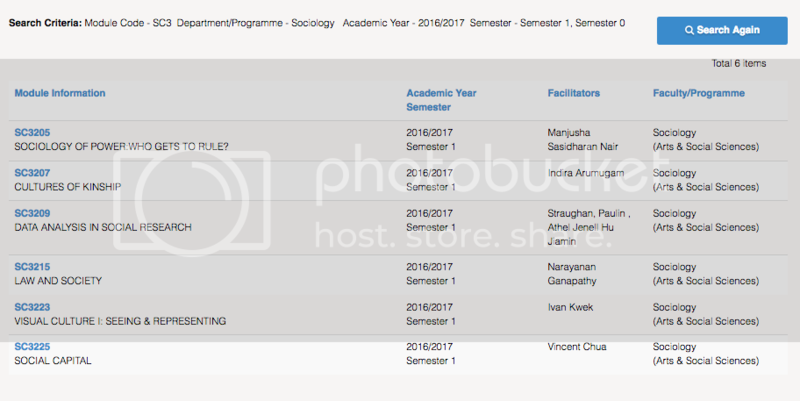 DSC3XXX, don’t leave the “Department/Programme” bar blank; search for your desired faculty, and the results will be refined accordingly. 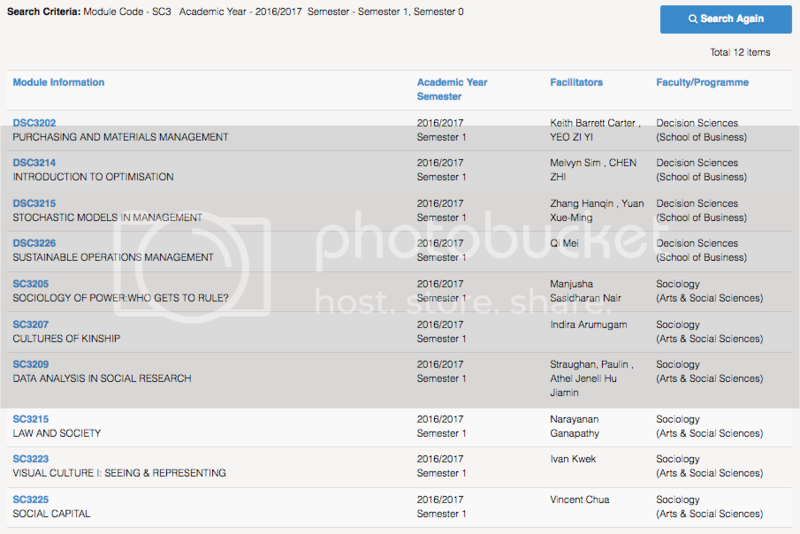 The “Academic Year / Semester” can be left blank: results will still differentiate between active (not highlighted) and inactive modules (highlighted in red). I suggest leaving this field blank because the results returned will then contain results from earlier semesters as well, which you can have a peek at. This is useful if the module for the upcoming semester hasn’t been listed on IVLE yet, because then you can have a peek at how the module has been taught in previous semesters. A word of caution: If you’re looking at module descriptors from a particular module taught in previous semesters, make sure that it is still taught by the same prof [to be taking it in the upcoming semester]. Chances are if it is still taught by the same professor, the reading list will remain fairly consistent, although assessment methods may change; but if it’s taught by a different prof, everything from reading list to course structure and assessment methods may change. In case of doubt, just email the professor – their emails are listed on IVLE. Of course, don’t bother them with frivolous matters, but most of them are extremely approachable :) The profs in charge are listed as “facilitators” on IVLE – just click on the tab next to Description, and you’ll have their names and emails. For more detailed guides for other IVLE functions, please head to https://wiki.nus.edu.sg/display/IVLEStudenKB/Home, courtesy of NUS! (2) Your prof might not be lenient with deadlines. There is no strict policy for marking down assignments that are late and it is usually up to each prof to decide how strict they’d like to be, but don’t test their limits. It isn’t fun for anyone: you have to think of how to craft the email to your professor, and your professor has to decide whether or not to believe you – and nobody likes excuses nor lies. They’re often painfully obvious too. So manage your time properly, and don’t leave assignments till the last minute.